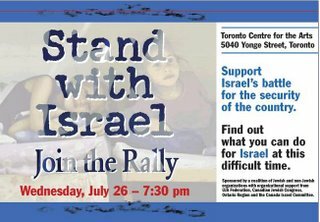 A rally to support Israel will be held in Toronto this coming Wednesday, 26th of July, at 7:30 pm in Toronto Center for the Arts which is located @ 5040 Yonge Street. Isn't Toronto on the other side of the bridge from Detroit, Michigan? or 30 minutes from Detroit? No, it is at least 4 hours away from Detroit. The city you meant is Windsor. OHHH! Ok, thanks for clearing that up. I just put up another post on my blog about some rallies here in the US. I wish I wasn't living in the sticks. I'd be there. Whats wrong with their spelling? The sign looks like it says Raily not Rally. It might just be an illusion because of the shading on it. Winston, I can't believe you really exist. Are there more Iranians like you? 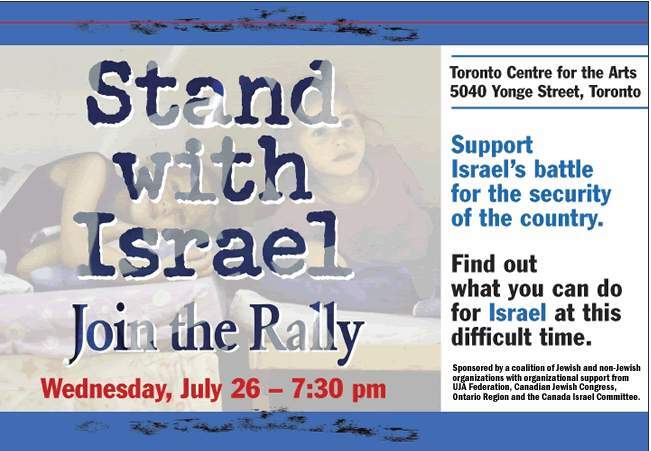 I didn't know about the rally (no matter how it's spelled). We in Israel would like to know about these things. G-d bless you! If you are going, have a great time. If it is too far, I hope everyone there has a good time. One thing that really bothers me, though. Why is it that no one bothers idiots when they have their protests, but they have to try to spoil ours? Go Israel!